If you tend to be in a certain age category, you’ve most likely thought about caregiving for a loved one. Whether that be for your parents, siblings, children, other relatives or even friends, it can take on a life of its own. Caregiving is no easy task, so fully thinking through how this may play out in your life is a good idea (even if it is overwhelming). By planning ahead and being realistic about the situations in your life, you stand a better chance of decreasing the upfront stresses when you step into a caregiver role. Better to have a plan and be prepared for it to go awry! You can expect to endure some stress along this journey, given the list of schedule changes, transportation challenges, medical decisions, housing choices and other decisions you will have to deal with. In the midst of providing care for a loved one, it’s really easy to lose sight of caring for yourself. But it’s another important element to include in your plan; if you don’t consider it, you may be surprised at the toll it can take on your own health. 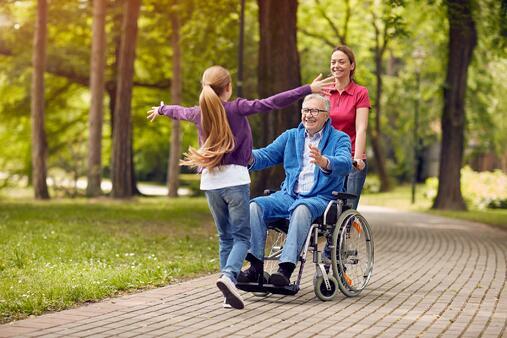 Below are some ideas that may keep you on a healthy track so you can be your best when serving as a caregiver for the loved ones in your life. Many caregivers get so consumed with all they need to do for those that they are supporting that they forget to keep their own life in order. There will be times when you’ll need to drop what you’re doing to be of assistance try not to make that a regular habit. Gauge the situation carefully and if it’s an emergency, the decision is clear. If it’s not, then you need to carefully decide if it needs your immediate attention. Can it wait? Is someone else medically able to offer assistance? Do they need this right NOW? Consider these questions before you put your life on the back burner every time something comes up. Do it in the beginning too so it doesn’t become a habit to take on these situations before taking care of yourself or putting your own life needs by the wayside. If you’ve never been a caregiver, it’s going to take some practice building a sustainable routine. If you have kids, it may be similar to tracking the after school activities, birthday parties, and school events. Build your caregiving schedule into your week so there’s some consistency. This could include grocery store runs, pharmacy stops, meetings with advisors and just spending some quality time with your loved one. By building a consistent schedule, you’ll feel more organized and less likely to have this new set of responsibilities throw you off track. Boundaries will be important as well, not only with your loved ones but with yourself. Remember that you’ll need to continue doing the things that you love and enjoy; you are the only one who can take care of you. So, if you start to feel that caregiving is encroaching on your everyday enjoyment due to the demands, it may be time to create some boundaries. This may include limiting phone calls at certain times of the day, answering emails or texts when time allows, and not allowing disruptions to your everyday life when possible. Of course there will always be emergencies but don’t let every form of communication become one of them. As a caregiving you’ll find that you may feel guilty due to the lack of time you can spend with your loved one as you try to juggle life. To prevent this, see if you can incorporate some activities with them and your normal schedule. This might include a walk with your loved one at the park on Sunday with the entire family. Pack a picnic and you have the opportunity to get some exercise for yourself, and to spend time with them and your own family. Seek outings that offer everyone some enjoyment. Being a caregiver won’t be easy but you can build a routine that works for you and them with some careful thought. Start out on the right foot so you don’t build something that may fall apart or leave you feeling out of your element and exhausted. The goal is a win/win situation where everyone feels cared for, loved and fulfilled.